DEAR READERS: The following is an updated version of my holiday article that was first published in 2005. At the time, The 'Skeeter Bites Report was in only its second week of existence -- and almost immediately after my holiday article first went online, it was overshadowed by major breaking news. Consequently, only a handful of people got to read it -- which prompted me to publish it again last Christmas. Today, readership of this blog has grown significantly, so I decided to revive a tradition started by the late advice columnist Ann Landers and republish my holiday article in an updated form every year. So it's with great pleasure that I present the 2007 edition of "The Pagan Roots of Christmas." Enjoy -- and may your holidays be filled with joy, peace and love. Blessed Be! Ah, December. 'Tis the season when most of us are thinking about opening gifts under brightly-lit trees. Of kissing someone special under the mistletoe. Of eating, drinking and making merry. And, above all, of hoping for peace on Earth and goodwill to all. But in 2007, on what ought to be the most festive time of the year, "goodwill to all" still appears to be in short supply in America among certain conservatives, who continue to rail against what they perceive as a so-called "War on Christmas" because of what appears to be a lessening in recent years of the Christian symbolism of the holiday. A Bremerton, Washington man decided to make a statement by nailing an effigy of Santa Claus to a 15-foot-tall cross and hoisting the crucified Santa in his front yard. Art Conrad says he has an issue with the commercialism of Christmas, and acknowledged to The Associated Press that his protest has gone way beyond just shunning the malls or turning off his television. "Santa has been perverted from who he started out to be," Conrad said. "Now he's the person being used by corporations to get us to buy more stuff." A photo of the crucified Santa adorns his Christmas cards, with the message "Santa died for your MasterCard." But the display is also Conrad's way of expressing his displeasure at what he thinks is "political correctness" in the increasing secularization and de-emphasis of the Christian aspects of the holiday. He believes Christians aren't expressing their true feelings "because they're afraid of what other people might think." It was just two years ago when leaders of the then-Republican-controlled House of Representatives, including then-Speaker Dennis Hastert, were in a tizzy over the congressional tree that was lighted on the Capitol grounds the night after Thanksgiving being called the "Capitol Holiday Tree" -- as it has been for the past couple of years -- instead of the "Capitol Christmas Tree." After a hue and cry from conservatives, the House Republican leadership pushed through a resolution to henceforth officially call it the "Capitol Christmas Tree." This tempest in a teapot under the Capitol dome would have been dismissed as just another typical venting of partisan Washington hot air, were it not for a certain conservative-leaning 24-hour cable TV news network-- or, more specifically, its top-rated prime time talk-show host. Two years later, Fox News Channel's Bill O'Reilly is still inveighing against an alleged "War on Christmas" by secularists. O'Reilly is still hopping mad about the use of the greeting "Happy Holidays" -- and even the long-traditional "Season's Greetings" -- instead of "Merry Christmas" on public buildings and has been on an aggressive public-relations offensive to put a stop to it. Indeed, for the third consecutive year, O'Reilly has won this blogger's Hunter S. Thompson Memorial Gonzo Award for overreactive fear and loathing. He's still spilling his guts out against "secular progressives trying to de-Christianize Christmas." Two years ago, O'Reilly told his viewers of a "secular progressive agenda ... to get Christianity and spirituality and Judaism out of the public square." This year, he's chosen to pick a fight with the the town selectboard of Great Barrington, Massachussets over its decision to restrict the number of hours that holiday light displays can be kept turned on. Bear in mind, O'Reilly isn't just angry over the fact that the lights have to be turned off at 10 p.m. each night as an energy-saving measure. He's really ticked off that the town is calling its displays "holiday" lights instead of "Christmas" lights. 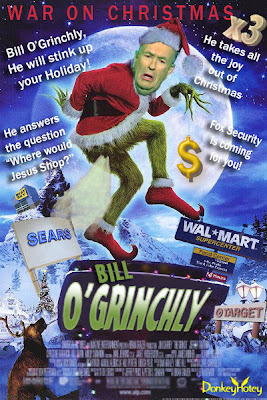 What O'Reilly presents is, as Ebenezer Scrooge might say, a load of pure, unadulterated humbug. Never in my life have I seen or heard such a crescendo of ecclesiastical arrogance by a right-wing crybaby who has the audacity to call himself a "Christian," for he's acting anything but Christ-like. "I mean, how stupid is this? For a few weeks every year, the United States of America gets festive in honoring the birth of a man whose philosophy helped shape this country. That, of course, would be Jesus, not Barry Holiday," O'Reilly fulminated in his nationally-syndicated newspaper column. "And every year we now have to hear whining from dolts who are offended not only by a baby laying in a manger, but also by images of decorated trees and a jolly old man in a beard. Call me a theocrat, but I have had enough of this politically correct bilge." Well apparently, the feeling is mutual, for this blogger has had enough of Bill O'Reilly's arrogant, holier-than-thou bilge. And I'm not alone. Michael Scott Leonard, a columnist at the local newspaper, The Berkshire Eagle, fired back at O'Reilly, accusing him of "simply pandering to . . . the phony outrage base of America's right wing." This phony outrage base, Leonard wrote, "consists of 'pundits,' 'commentators' and other reactionary blowhards and bloviators seeking to distract Americans from the serious issues our country faces by appealing to the worst in people and stirring up irrational, often hateful passions." O'Reilly "and his ilk don't find and exploit 'wedge issues,' as the conventional wisdom holds. They conjure them out of thin air," Leonard continued. It's clear to this blogger that O'Reilly is engaging in conduct more befitting of the Pharisees -- who hounded and harassed Jesus at almost every turn during the three years of his public ministry -- than of Christians who genuinely live their lives in accordance with the teachings of the Bethlehem-born carpenter from Nazareth. O'Reilly and a host of other latter-day Pharisees think they own this late-December holiday lock, stock and barrel. They don't. They never have and they never will, for Christmas is not for Christians only. It never has been and it never will be. And for a very good reason. O'Reilly and company are in stubborn, bullheaded denial of a fact of history that won't go away: The holiday the world celebrates on the 25th of December is thousands of years older than Christianity itself. Yule celebrates the beginning of the sun's light and warmth returning to the northern hemisphere after reaching its southernmost point on the Earth at the Tropic of Capricorn on the winter solstice. Best known today for their celebrations of the summer solstice in June at Stonehenge, the Druids decorated their trees for the winter solstice in December with symbols of prosperity: a fruitful harvest, coins for wealth and various charms such as those for love or fertility. Scandinavian Pagans became the first to bring their decorated trees indoors, as this provided a warm and welcoming environment for the native fairy folk to join in the festivities. The Saxons, a Pagan tribe from what is now Germany, were the first to place lights on the their trees in the form of candles (an extremely dangerous fire hazard by today's standards, I know). For centuries, the ancient Romans decorated their homes with evergreens at the winter solstice festival of Saturnalia -- which also marked the Roman New Year -- and exchanged evergreen branches with friends as a sign of good luck. Christians' use of the tree symbol for the December holidays did not begin until the 16th century, when devout Catholics in present-day Italy brought decorated trees into their homes. The German-born Prince Albert, husband of Queen Victoria, is credited with starting the tradition in England in 1841 when he brought the first Christmas tree into Windsor Castle. # Samhain (pronouned SOW-en), the Wiccan New Year (Halloween, October 31). The current debate in the United States over "Christmas" versus "Holiday" trees, decorations and greetings is part of a much deeper clash of cultures that has gone on for centuries: Christianity vs. Paganism. Christianity is monotheistic and linear; Paganism is pantheistic and circular. Pagans celebrate the eternal natural cycle of being. Christians venerate the linear concept of progress, from creation to ultimate redemption. And for many conservative Christians in particular, that tension could only have grown sharper in recent years as the number of Americans who do not identify themselves as Christian has been growing exponentially since 1990, according to data compiled by the American Religious Identification Survey (ARIS), commissioned by the U.S. Census Bureau. By comparison, out of a total U.S. adult population of 175.4 million believers in 1990, 151.4 million, or roughly 85 percent, identified themselves as Christian. The number of Americans who do not identify themselves as Christian grew from 20.1 million (15 percent) in 1990 to 37.1 million (25 percent) in 2001, according to the ARIS data, with particularly sharp increases recorded in the number of adherents to Islam and Buddhism. America's Muslim population has more than doubled, from 527,000 in 1990 to 1.1 million in 2001. The nation's Buddhist community grew even faster, according to ARIS, from 401,000 in 1990 to 1.08 million in 2001. While there was no census of American Pagans in 1990, the ARIS survey did report at least 307,000 Americans identifying themselves as such in 2001, with 134,000 professing to be Wiccans, 33,000 as Druids and 140,000 as eclectic "neo-Pagans" of a wide spectrum of traditions. Interestingly, the ARIS survey counted only 53,000 Americans in 2001 as identifying themselves as "secular" and even fewer -- 43,000 -- calling themselves "humanists." There was no accounting of either group in 1990. The truth is, America in the closing days of 2007 is more religiously and spiritually diverse now than it's ever been before in its more-than-231-year history. That diversity is certain to grow in the future, further reducing American Christians' majority -- and O'Reilly and other conservatives are going to have to deal with it, whether they like it or not. Is It a Pagan Christmas -- or a Christian Yule? If they wanted to, today's Pagans could reclaim the Christmas tree -- indeed, all the decorative trappings of Christmas, save for the Nativity Creche -- as being rightfully theirs, since Pagans created them in the first place. But modern Pagans are a practical lot, with most viewing Christmas simply as the Christian world celebrating Yule in their own way -- albeit, three to five days after the actual winter solstice -- and thus see no conflict in celebrating the secular aspects of Christmas themselves. December isn't called the holiday season for nothing. There's also Hanukkah, Kwanzaa, Boxing Day (in Canada) and scores of other holidays and festivals around the world this month -- all of which culminate in the ringing in of the new year at midnight on December 31. Thanks to the adoption of the Gregorian calendar as the universal calendar used worldwide and the global system of 24 time zones, New Year's Day is our only truly global holiday -- which we all got to watch unfold on our TV screens in all its joyful glory as we greeted the new millennium (albeit, a year too soon).